All transactions are safe and secure with a reliable history in online purchasing behind each of our associates. 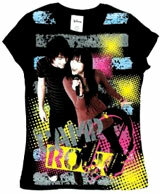 Buy the Shane and Mitchie Camp Rock t-shirt to own Camp Rock clothing and merchandise. Unleash your inner pop star in this Shane and Mitchie Camp Rock tee that displays an image of the two stars singing together. Shane Gray spends most of the Original Disney Channel Movie searching for the girl with the voice, as evidenced on the soundtrack by the song "Gotta Find You". He sings the song to Demi Lovato's character when they're sitting by the lake. Warm up with your sweetheart by wearing this clothing item under the Camp Rock hoodie sweatshirt displayed below. In addition to the Shane and Mitchie Camp Rock tee above, browse the Camp Rock Clothing Gallery for more apparel like men's and women's clothes, kids shirts or hoodies.